This is how to drink a frappucino. Three years regular bike commuting and I still can't hold a coffee cup and ride a bike at the same time. Maybe if I had a snuggly scarf like that one . . .
Something like this, in Padua, Italy! When you need both hands you just use the lower part of your palm while you hold on to the coffee with your fingers. Easy peasy. 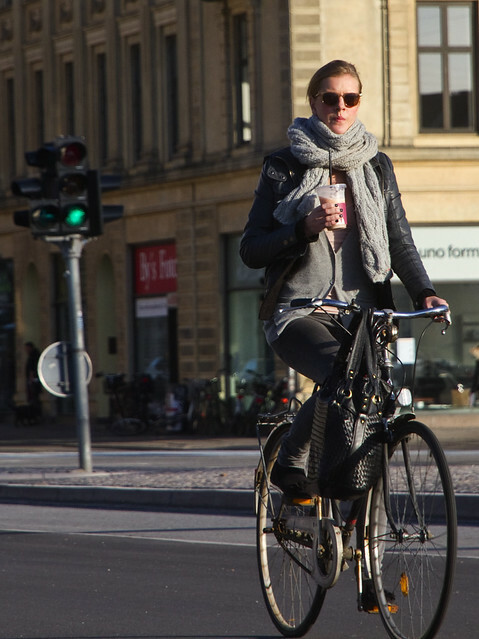 Or get a coffee holder for the bike (I got one for US$11 - best accessory for my bike ever!). Personally, like cycling life should not be rushed, I prefer to sit in a cafe having my coffee and watch the stylish cyclists go by. Drinking coffee should not be rushed indeed. You have to relax and drink coffee.